Ramsi and Rhona Kamar, as chefs and owners of Ramsi’s Cafe on the World, were inside their restaurant or their home above the restaurant constantly. They were raising three children and running a successful business, all within in the boundaries of Bardstown Road and the Highlands neighborhood. Twelve years ago after seeing a listing in the paper, they bought a 15 acre farm and basically sat on it until they could develop their plan. The previous owner had not settled on the property, so it was in pristine condition. Raising Hope Organic Farm was born two years ago when they began the process of planting and building greenhouses and animal shelters. The plan entailed a completely organic farm, which is a hearty proposition in itself. Qualifying as an organic farm is painstaking and they achieved their organic certification last fall. After seeing the Kamars out on this farm, it is hard to picture them in the restaurant, but this farm holds special meaning for them. Rhona was raised on a farm in Green County but claims to not remember much from her farming-centered childhood. Like riding a bike, she seems to have tapped into her roots; farming and nurturing comes naturally to her. Rhona picking lettuce for salad at Ramsi’s. But it is Ramsi who is the most taken with the farm. He rises early and comes out here every day. He says he has never felt so right in a place. It is a sacred sense of place. Ramsi and Rhona cuddle with their new baby goat, who they named “Heidi Potter.” I’m so proud of my namesake. There are bricks stacked for a future patio that will be surrounded by olive trees, blooming greenhouses and crops. A sunset or starry night would be magical here. As an organic farm, they create all of their own soil with composting and the hard labor of worms through a very specific scientific process. Soils are in all phases of process around the greenhouse, from the initial huge compost pile with Heine Brothers coffee filters and grounds on the top, to the fertile finished product. Though there is a lot of complicated science involved, suffice it to say, they produce a soil that enables them to grow beautiful crops with no fertilizers and no pesticides. It is totally organic and their crops thrive in this soil. There were tons of crops just in the ground when I arrived in mid-May. Lettuces, strawberries, garlic and kale were all ready to be harvested. 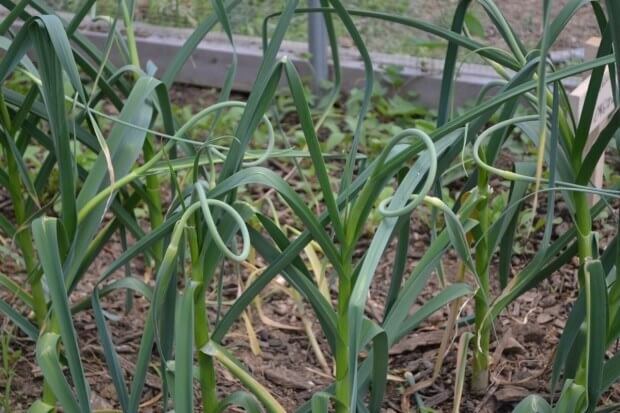 These are garlic scapes. They are like a very tough green onion and delicious when roasted. Did you know that yellow chicks are for eating and brown chicks are for laying eggs? There are plenty of hens around too, all laying eggs. A few beautiful but mean roosters roam the premises. I had never heard a hen laying an egg and when I did, it reminded me of childbirth. Considering that they lay at least an egg a day, it makes appreciate the epidural even more. Goats are here, as well. With one billy goat, who is an ornery fellow with a long troll beard, a few females and some new babies, goat cheese is on the horizon. Here’s the mean male goat. Ramsi is holding him so he won’t attack me. Heidi Potter, human, holding Heidi Potter, goat. Most striking is the design aspect. The greenhouses are architecturally beautiful, as are their offices (the green building), the hen house and the goat house (which I’m sure has a more professional agricultural name, but I don’t know it). The goat’s house. They love climbing up and down. The Raising Hope Farm offices are here, in this beautifully green-hued building. It is a bare bones operation, but there is electricity. Ramsi loves his offices here. Office signage written in Sharpie on the door. The Kamars were more than generous with the distribution for me that day. I received kale, three kinds of lettuce, some garlic and strawberries. Hungry yet? If you go to Ramsi’s you can have all of this lovely lettuce and whatever else they have harvested. They were planning the night’s menu as we clipped lettuces and pulled strawberries. About a week later, we went to Ramsi’s and experienced this food cycle on our own. They had a pesto on their foccaccia that I could have drunk with a straw it was so fresh. Salads and veggies were all fresh and delicious. Ramsi’s is now offering a Hope Farm Wellness Menu at their restaurant and for corporate lunch delivery. This menu is gluten-free, dairy-free, and vegetarian or pescatarian. For more information on Ramsi’s, such as their menu or hours, visit the website: www.ramsiscafe.com.